Based on the Stephen King novella Secret Window, Secret Garden, this film version from director David Koepp (Stir of Echoes) manages to make a story about a pair of authors fighting over who created a story first rather exciting. Mort Rainy (Johnny Depp) is a disheveled fiction writer going through a messy divorce from Amy (Maria Bello), who left him for Ted (Timothy Hutton), a smarmy "rubbernecker" whose immediate ambition is to get Mort to finalize the divorce papers. The film doesn't waste time jumping into the driving element of the story when a creepy stranger with a Southern drawl and a big wide hat named John Shooter (John Turturo) arrives on Mort's remote cabin doorstep, hurling bitter accusations of plagiarism regarding a short story of Mort's entitled Secret Window. Claiming Mort changed the ending, Shooter wants his story "put right" or else, and to prove his point a string of mysterious deaths begin to occur as warnings. Plagiarism and looking for a back issue of an Ellery Queen mystery magazine isn't exactly the most riveting of subjects, but King does love to write about writers, and the events that transpire here get progressively darker—no surprise there, considering the source. Though the author has traversed similar ground before, this time the material seems especially suitable for a 90-minute thriller, and David Koepp (who also wrote the screenplay) joins the short list of directors who have been successful in their attempts to turn works by the popular author into solid bits of funhouse entertainment. Koepp's helped by a nice bit of acting from a wildly unkempt Depp, having a permanent case of bad hair day and wearing the same ratty robe for most of the movie, shuffling around his cabin with a bad case of writer's block and a psycho lurking in the woods. It's an intricately layered role, and Depp, who acts most of his scenes alone, is a far cry from the flamboyantly hammy Jack Sparrow from Pirates of the Caribbean. I took three complete looks at Secret Window—after listening to Koepp's commentary and the accompanying featurette—and on each subsequent viewing I really came away with more of an appreciation for the film's deceptively slick visual style, in which Koepp and his D.P. Fred Murphy really employ an array of cleverly staged sequences that are not the hit-you-over-the-head kind, but instead are the kind of complicated shots made to look so simple that unless you're really paying attention, just might slide past. There's quite a lot more going on han meets the eye at first glance, and Koepp (who also wrote Panic Room) works all the pieces effectively. 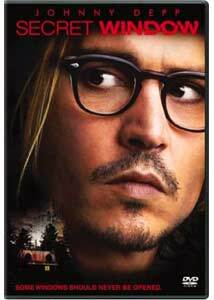 In the end, Secret Window may not offer all that many real surprises—especially if you're a King reader—but David Koepp has taken a potentially tough story to film, and kept the tone dark, not caving in to a climax that is necessarily neat and tidy by traditional standards. Image Transfer Review: Columbia TriStar has issued Secret Window in a 2.40:1 anamorphic widescreen transfer. Image quality is quite good most of the time (some scenes seem to lack a consistent sharpness), but the vibrant color reproduction is especially strong throughout. Black levels are rock solid as well, and the frequent scenes that take place outside, at night, reveal strong shadow depth and fine detail. The print is free of any blemishes, and there were no major compression issues to contend with; only some minor instances of edge halos were visible. Audio Transfer Review: Audio is provided in Dolby Digital 5.1, available in either English or French. Presentation is relegated largely to the front channels during the first two-thirds of the film, except for the occasional cricket sound coming from the rears; it's a pleasing mix, but really rather nondescript. The soundtrack really takes a leap forward during the final portion, when the surrounds come to life as the story builds to a crescendo, and the effect is nicely done. At all times dialogue is clear and discernible, with no hiss or distortion evident. Extras Review: Director David Koepp provides a full-length, scene-specific commentary track recorded ten days prior to Secret Window's theatrical release, and does a fine job discussing the visual elements of the film, from the use of CG through various camera movements, when and where the infrequent Steadicam shots are used, and touching on simple things like selecting the type of phone a character uses. Koepp is an amicable speaker, and his comments about writing the screenplay, and making minor adjustments to King's story (with regard to locale, for example) are interesting, as are his self-deprecating remarks about the intensity of Depp's flashlight beam. Some of the content is also covered in the accompanying featurettes, but bits like the inclusion of a few cut lines of a Depp voiceover within the commentary is a neat bonus. An informative Laurent Bouzereau-directed featurette is presented in three separate chunks—From Book to Film (19m:06s), A Look Through It (29m:06s), Secrets Revealed (14m:01s)—and is viewable with the Play All option or as individual pieces. All three should only be watched after seeing the film, because much of the content concerns discussion of key plot specifics. There are four Deleted Scenes, running a total of 05m:58s, two of which are available with an optional commentary from director Koepp, and can be viewed individually or with the Play All option. The scene of merit is an alternate take on the ending, which borders on being gratuitous, and while interesting to see, I think Koepp made the right decision on editing it. Four Animatic sequences, where blocky computer graphics are used to test out some of the effects sequences, are also included. None of the four are particularly long, nor entirely necessary to have as an extra unless you happen to be an up-and-coming computer graphic artist. A large sampling of trailers are provided, and the disc is cut into 28 chapters, featuring optional subtitles in English or French. It's not very often that a Stephen King story gets translated decently into a feature film, but Secret Window is one of them. As a creepy thriller, it is appropriately tense without relying on excessive cheap jump scares, and the whole thing pays off very nicely, if you ask me.